JustFresh is one of four brands made by DW Fine Pack Inc. 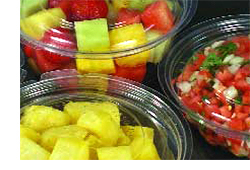 They produce bowls and containers that have a clear lid, which are great for serving fruits, salads, and a variety of food items. JustFresh is a sustainable brand, whose products are made from a renewable material. This means we are not depleting the resources given to us by the Earth. DW Fine is very committed to maintaining a helping environment. JustFresh uses a special biopolymer, NatureWorks® Ingeo™. This is made from 100% renewable resources. JustFresh, like the other DW Fine Pack brands, branded their bioplastic material as NaturesPLAstic®, and subsequently developed several product lines with unique, superior qualities well suited to the industry. JustFresh™ clear bowls and tubs show off the freshness of products inside, and utilize tamper-evident lids that seal in contents with no shrink banding required. Made from a NaturesPLAstic® (Ingeo™ biopolymer) blend, these leak-resistant bowls and tubs are a popular choice for fresh fruits, vegetables and deli items and come in a variety of convenient sizes. They feature crystal clear construction and a juice reservoir in the bottom to keep produce fresher, longer. And DW Fine Pack’s patented tamper-evident closure system comes with an air-tight triple lock to protect and seal in freshness.